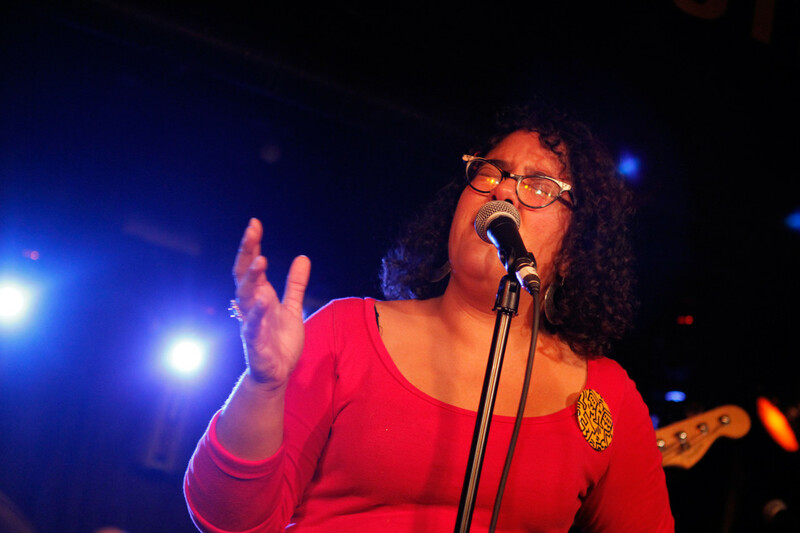 On Sunday, Jan. 13, New York City’s Webster Hall was overtaken by 12 diverse musical acts from all over the world as part of globalFEST 2013. While I only recognized a small handful of names on the bill, the setup at globalFEST is perfect for wandering from stage-to-stage and sampling little tastes of bands without worrying about missing too much. And that’s exciting — it was a night of pure discovery. The evening had a lot of memorable moments (NPR Music was there filming a whole slew of sets from the night, well worth checking out), but few as instantly winning as Mucca Pazza, a 30-piece Bizarro World circus of musicians and weirdo hipster cheerleaders, all decked out in colorfully clashing retro marching band uniforms. The Chicago-based group — which gets its name from the Italian phrase for “crazy cow” (also a name for Creutzfeldt-Jakob disease) — has been banging around for years, but this was my first exposure to its visual and musical mayhem. It was a total blast. Seeing this irresistible band of horns and violins, guitars and accordion all parade in and eventually take the stage is infectious, chaotic fun. But it’s also an incredibly coordinated and choreographed performance full of cheers and bursting with energy that is easy to get caught up in. Typically my musical tastes default to introspective, darker music full of layers of noise and distortion and all of that. Yet watching Mucca Pazza reminded me of many similarly giant, celebratory acts I’ve seen over the years: The Flaming Lips and its confetti canons and furry animal costumes; Edward Sharpe and the Magnetic Zeros’ sprawling community singalongs; the gypsy punk anarchy of Gogol Bordello; and the roving What Cheer? Brigade who’s enlivened the grounds at the Newport Folk Festival with funked-up renditions of TV theme songs. 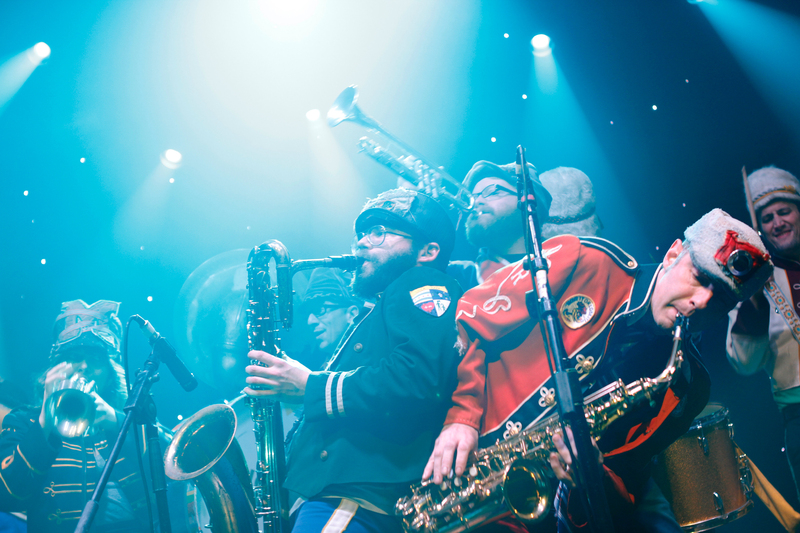 Mucca Pazza also brought to mind two big dance-friendly, smile-inducing bands that have won over crowds at globalFEST in previous years: The Ethiopian funk rock of Debo Band and the “Brooklyn Bhangra” group Red Baraat. 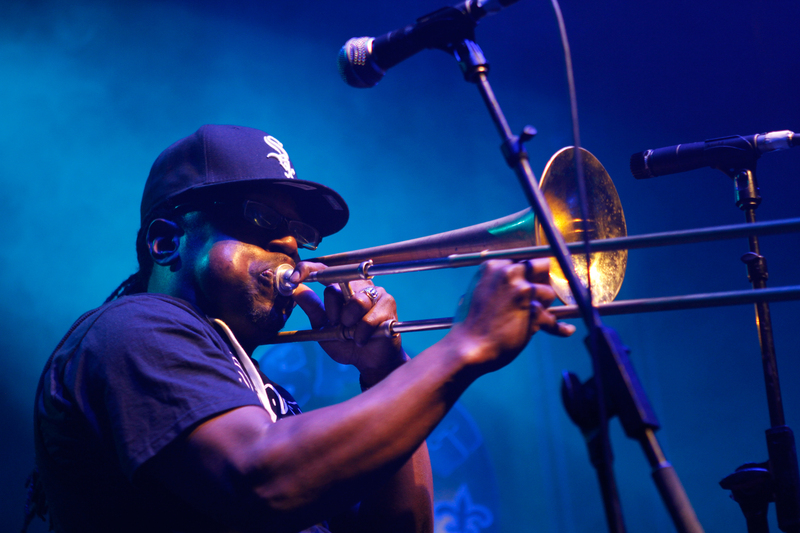 And of course, all of these acts share some DNA with both traditional and modern genre-blending New Orleans brass bands that have been playing “forget about your worries and dance” music since, like, forever. You can see and hear all of that in Mucca Pazza’s music. Yet what stood out the most was not only the feel-good aesthetic of Mucca Pazza’s live show, but how outright wackadoodle and entertaining it could be. If only my high school marching band was this crazy and fun.